Boral Versetta Stone comes in a wide variety of colors to match any home exterior. If you want to update your home's exterior, siding is a good place to start. 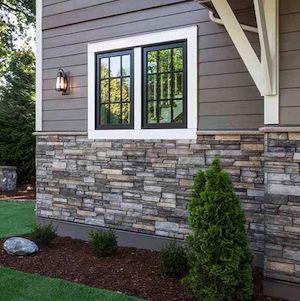 If you're looking for a traditional appearance combined with durability, stone siding might be one of the best options. Trinity Exteriors, Inc uses quality Boral Versetta Stone® products. Learn more about our stone siding options or contact us today to schedule your in-home consultation and siding cost estimate in Minneapolis, St. Paul, Eden Prairie, Minnetonka, Burnsville, Inver Grove Heights, Cottage Grove, Chanhassen, Rosemount, Savage, and nearby. The challenge was to fully replace the entire vinyl siding of this beautiful property, so that it echoed the gracefulness and integrity of the entire development’s address. All siding and existing stone was tore off and updated with new Boral’s Versetta Stone® Tight Cut in the blended palette colors of Terra Rosa. Each manufactured panel is carefully measured, cut to specifications, and strategically fastened to the exterior walls of the home. The results was a first ever complete Versetta stone wrap in the U.S.! Upgrading this vinyl sided home, to a home that now reflects a statement with its beautiful surroundings within Shakopee, Minnesota. If you're considering installing or replacing siding on your home, schedule an in-home consultation today and let one of our experts explain the features of our stone siding products and show you samples. With a large selection of colors, we are certain that we have a siding option to complement the style of your home. We offer our siding installation services in Minneapolis, St. Paul, Eden Prairie, Burnsville, Minnetonka, Cottage Grove, Inver Grove Heights, Savage, Chanhassen, Rosemount, and Greater Twin Cities Metro Area. Schedule your siding installation cost estimate today!